The Chaos Communication Congress is on a “Peace Mission” this year. This time we are coming in peace, but not to conquer or colonize a new world. We come in peace to explore. 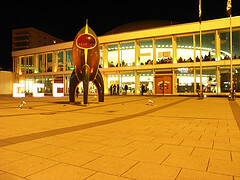 The expedition starts as every year 27th till 30st of December 2010 at the Berlin Congress Center. The 27C3 stands for state of art hacking as well as for new and different ideas of politics and privacy in a time where the cyberspace finally is part of each aspect in our live. The 27C3 is organised by a big community and a helping hand is always welcome. You can volunteer yourself at the Congress for beeing a Guardian Angel, Net Angel or at the CERT(Chaos Emergency Response Team). To enjoy high class speeches is one of the things you can do at the 27C3, but there are also many projects and workshops looking for nerds and loads of nerds seeking new projects. So feel free to participate and present your ideas at the 27C3. This entry was posted in Event and tagged 2010, 27C3, BCC, CCC, English, Events, special price, Whats up in Berlin by U inn Berlin Hostel. Bookmark the permalink.